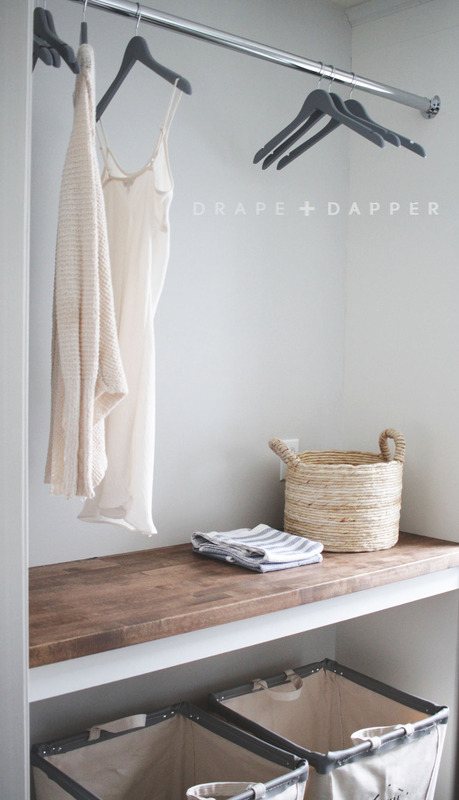 This Laundry room was on my laundry list since the day we moved in nearly five years ago. It took that long to convince my other half that it needed some TLC. It wasn’t horrid but it was just not functionally doing it for me. 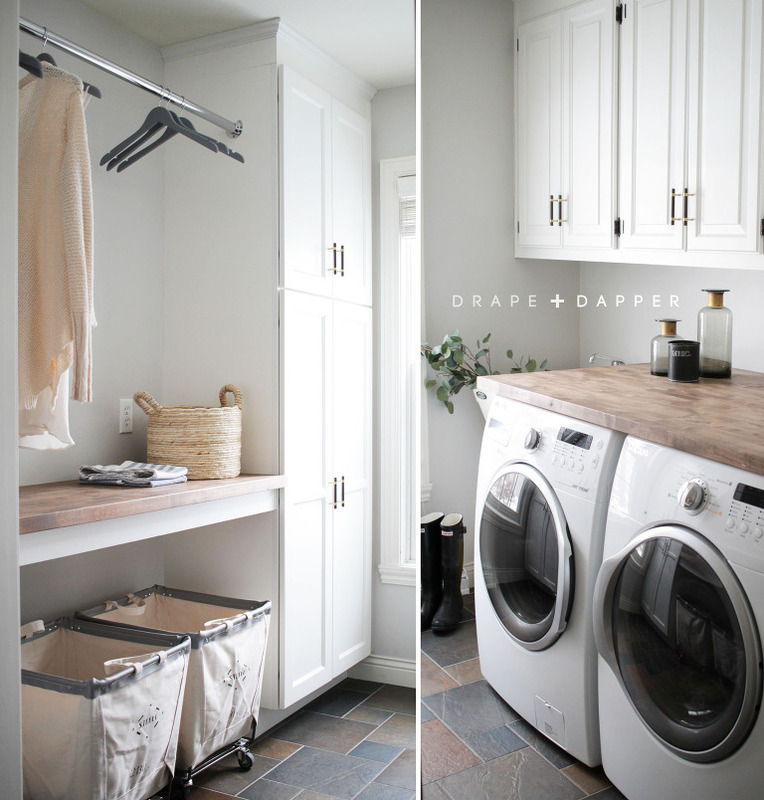 The washer and dryer stuck out almost 8″ from the back wall, making it a catch-all for clothing. The opposite wall had no storage whatsoever, only a long lonely rod hanging out. The other issue, besides the storage + functionality is the location. While being off of the back entry is not the worst spot, it’s next to the only first floor bathroom and an eye shot away from the kitchen. Meaning this dumping ground is viewed by many guests. Did I mention it lacks a door!? So I set out to make some small improvements that would be pleasing to the eye and add more function to the small space. 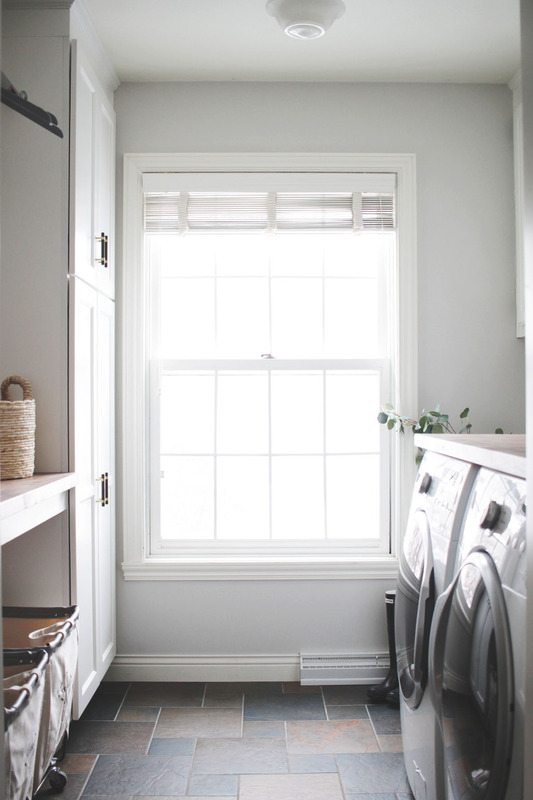 Since the upper cabinets were already white, I figured I would go with the flow and keep the look light and airy. 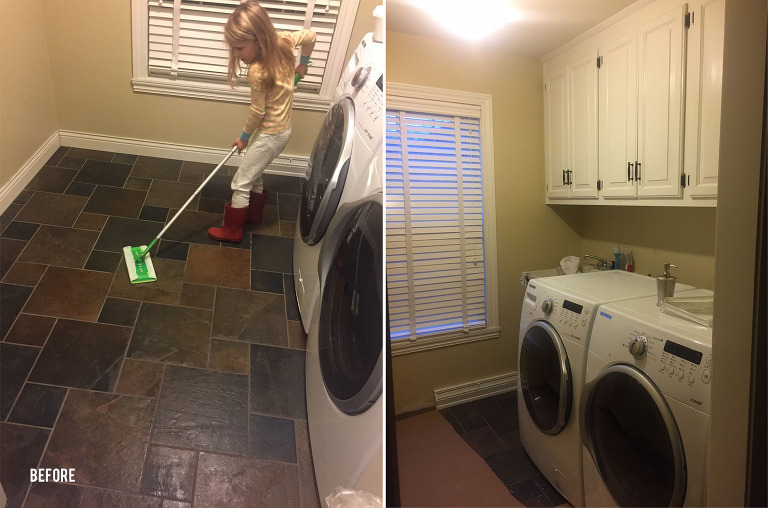 I had a floor to ceiling height cabinet installed to act as a broom closet and added a counter for folding with room for laundry carts below – aren’t they the cutest?! Since the floors were already a dark slate colored tile, to tie in some warmth and texture and contrast the cabinets, I decided on butcher block counter tops in a walnut finish. The counters are by far my favorite element and the best part is that they were really inexpensive! My second favorite element is the hardware…this was a splurge for sure but a game-changer in my opinion. I love the look of the oil rubbed bronze + brass. Enough type, check it out yourself! More details/links below. My little helper prepping before install /// Opposite: see what I mean about drab!? These carts! I loved the look and was stoked that they are super functional + well made. Water color print – Society 6 (The Aestate) love her work! Framed 15×21 size in conservation walnut- under $50! Counter top details: I had priced a few options out at custom places and they were all coming in over $1500 for the 2 pieces (not including install). I almost pulled the trigger on ordering from Ikea but with shipping the total was almost $900. Soooo luck have it, I was visiting a friend whom had a farmhouse style table that she and her husband made from butcher block slabs sold at Menards. It was exactly the look I was going for. Yay! So I scored two pieces from Menards for under $300 (with rebate). These are unfinished and can be cut to size. I used the larger island size for over the washer and dryer and the smaller counter size for the opposite wall. Staining them was really easy and it required minimal sanding. It only took me a few hours and I waited a day or so between coats. I applied two coats of Minwax stain in special walnut . After it was installed I applied a polyurethane sealer in a satin finish since I didn’t want the glossy ‘lacquered’ wood look. *Side note: since we are planning to replace the sink, I didn’t want to permanently affix the counters over the washer and dryer. Right now it’s just a floating top and it’s actually working fine like that since it’s super heavy and doesn’t move. Send us a note or leave comment if you have questions – we like to hear from you!